Today we officially release our love letter to the Mass Effect series. A point and click "demake" parody/satire of the Mass Effect series. We look forward to everyone's feedback! Over a year in the making we put a lot of time and love into this game. And it was the perfect outlet for our Mass Effect love while we awaited the release of Mass Effect Andromeda. Best of all we managed to finish it and clear our schedule to play Mass Effect Andromeda. After March 21st (or rather March 16th thanks to EA Access) you may not hear from us for a while as we utterly immerse ourselves into the world (or rather galaxy) of Mass Effect Andromeda! We could not be more excited! 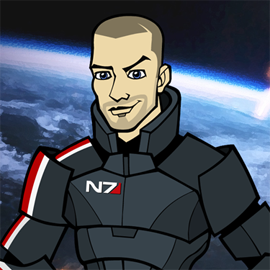 And for the other Mass Effect fans out there, you can fill a little of that wait time in by playing The Adventures of Commander Shepard! Go check out the games project page and download it today!